Knowing how to code can give you an edge in a growing variety of fields. Whether you're interested in becoming an artificial intelligence engineer or a web developer—or simply want to use programming to enhance your current career—you'll need a strong foundation, and in this program, you’ll build a strong foundation in fundamental programming concepts. You won't need any prior experience with coding to enroll, and we've extensively tested the lessons with beginning students to make sure they're understandable, engaging, and effective. If you want to learn to code but have little or no experience, this program offers the perfect starting point. No prior experience with programming is required. You will need to be self-driven and genuinely interested in the subject. No matter how well structured the program is, any attempt to learn programming will involve many hours of studying, practice, and experimentation. Success in this program requires meeting the deadlines set for your termand devoting at least 10 hours per week to your work. The only technical skills required for this program are basic computer skills. This program consists of one four (4)-month long term. To graduate from the program, you'll need to successfully complete all required projects. Passing all of the projects will earn you an Intro to Programming Nanodegree program certificate confirming that you have completed this program and obtained fundamental programming concepts and skills. I have graduated from the Intro to Programming Nanodegree program but I want to keep learning. Where should I go from here? The Intro to Programming Nanodegree program gives you a solid foundation from which to start a wide variety of more advanced and more specialized programs. Here are some recommendations for what you might want to try next. Please note that for some of these programs, you may need additional prerequisites that are not covered in the Intro to Programming Nanodegree program. You can find detailed info on these prerequisites on the pages linked above. Propel is the flagship Career Fair of Udacity in India. Only Advanced Job ready Nanodegree graduates have access to Propel. Through this initiative we connect our Nanodegree graduates to new-age technology companies and help them achieve their career goals. 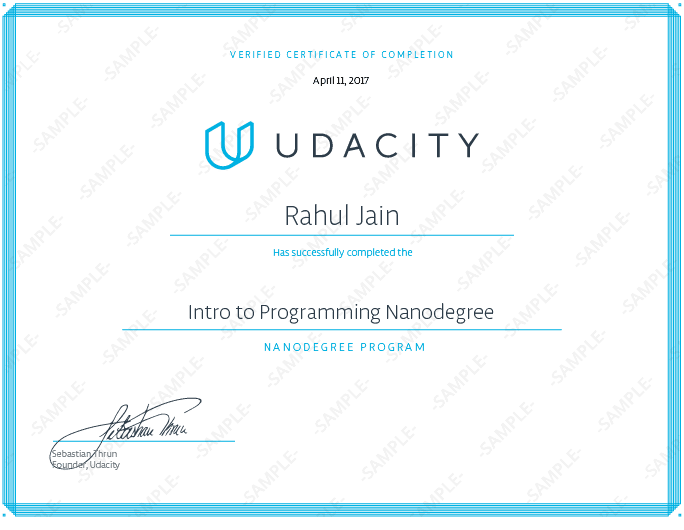 Since this program is not job-ready, you will be required to take up advanced Nanodegree after graduating from this program. Which version of Python is taught in this program? The Intro to Programming Nanodegree program teaches Python 3.